When I walk the woods of Pennsylvania, I know the trees. My grandfather -- my mother's father -- taught me to identify many of them. Others I picked up by osmosis. In my adulthood, I learned the Latin names of a lot of trees from my then-husband, who had a forestry degree as well as various other scientific attainments. When I first visited California -- Los Angeles -- in 1993, not knowing the tree names drove me crazy. Nobody I asked could tell me the different kinds of palm trees or anything else. A long walk in the UCLA botanical garden, which labels the trees and bushes, helped temporarily. After a few days I flew home, back to the familiar oaks and maples and dogwoods of Philadelphia. After 13 years in the SF Bay Area, I can identify the trees I routinely encounter. But a few weeks ago, pokershaman and I visited the botanical gardens at the Huntington Library in San Marino -- close to LA, and full of exotic specimens, most of which were unlabeled. I snapped a photo of it. (If anyone can tell me why this image didn't embed, I'd be glad to know.) Thank you, spiralsheep ! None of my research online helped. I hadn't taken a close-up of the leaves, unfortunately. Searching the Huntington website didn't help. (I personally think they should offer a plant-by-plant map of the place, with photos, Latin names, and growth habits.) However, the site did say anyone could email with questions. So I did. The arborist in charge of that section responded rapidly. 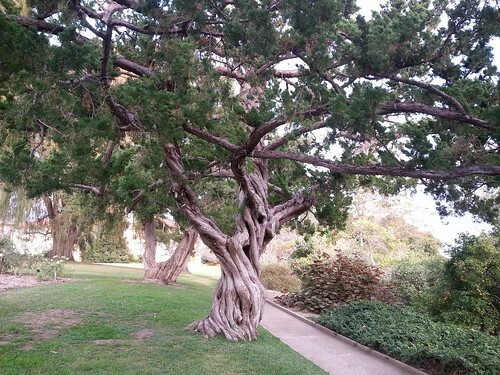 The tree I loved is a Hollywood juniper, usually seen as a large bush with twisted branches, or else as a bonsai. But the lovely, graceful tree is a far cry from the extremely popular landscaping bush. This one had the location, nurturing, and time to develop into its full self. OK, so I swiped the cut text from the title of a book by Thomas Pakenham. I highly recommend his books on trees. I'm running a day behind on the December Writing Meme, but I'm hoping to catch up. There are still some days open. Ask me a question -- any question. This entry was originally posted at http://wordweaverlynn.dreamwidth.org/642724.html. Please comment here if you want, or there using OpenID. Or send me a message via carrier pigeon or fortune cookie. I'm dying to hear from you.